The ROT-X-TRACT-L rotary liquid-liquid extractor allows for up to 8 liquid-liquid extractions to be performed at once. 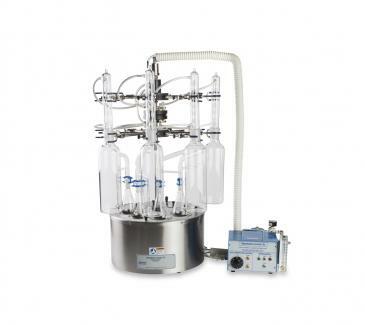 The instrument was designed to simplify extractions using a traditional liquid-liquid extraction apparatus or the Hershberg-Wolfe extraction apparatus. Traditional configurations of these extractors employ 250 ml boiling flasks, an Allihns condenser, and 1-liter extractor bodies. These highly efficient instruments provide continuous solvent extraction and use a large diameter return tube to minimize any chance of clogging. The extractor hardware can also accommodate Hershberg-Wolfe (H-W) glassware and frits for more accurate extraction of samples. The H-W extractor body assembly increases the amount of time the solvent is in contact with the sample promoting a more accurate extraction of analytes. Both the traditional and H-W extractors come with remote power and water control box. The control box provides a safety feature for unattended operation, automatically shutting off heat and water to the extractor when water flow from the return line diminishes. All extractors are engineered using a circular design for easy insertion and retrieval of samples. Please contact us for any specific questions about these instruments.